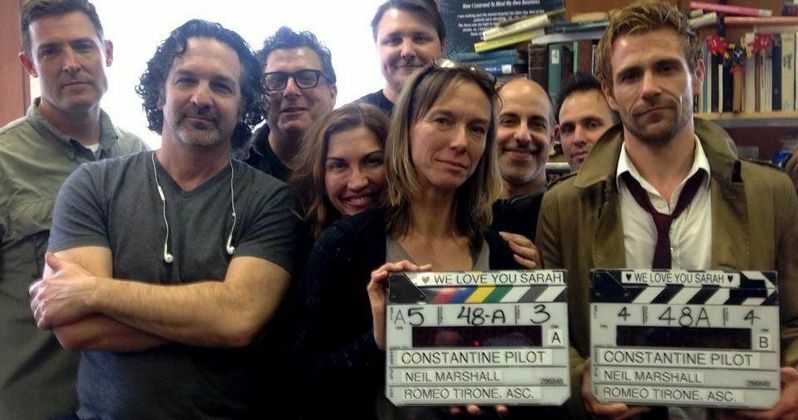 NBC has started production on the pilot for their new DC Comics series Constantine and two photos from the set have surfaced featuring the cast and crew. The pictures were released by Slates for Sarah, a Facebook page dedicated to the recently deceased camera assistant Sarah Elizabeth Jones. Check out series star Matt Ryan as the titled character in his full getup. Matt Ryan stars as Constantine with Lucy Griffiths portraying Liv. Harold Perrineau is the angel Manny and Charles Halford will be playing Constantine's friend Chas. The project is written by David S. Goyer and the pilot is being directed by Neil Marshall.